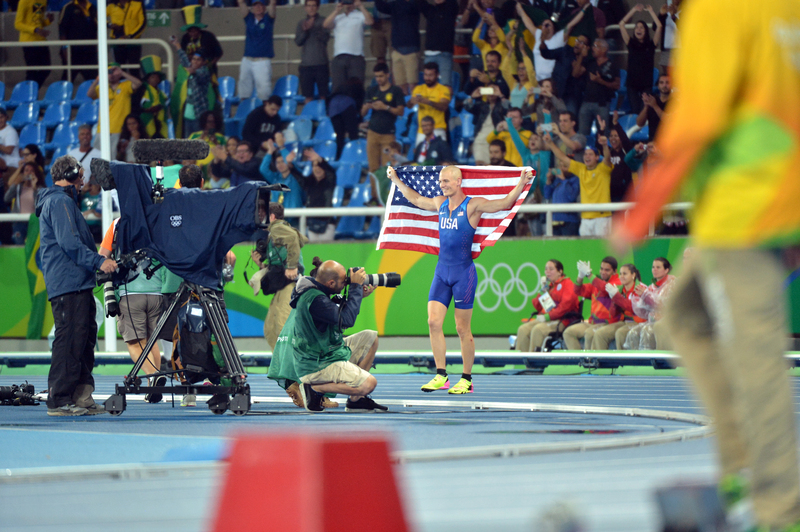 Army Reserve 2nd Lt. Sam Kendricks was content to walk away with the Olympic bronze medal following what he called “the most enjoyable pole vault competition of his life” at the Rio Olympic Games. It took two Olympic records, set by the gold and silver medalists, to top Kendricks’ vault of 19 feet 2 inches, and push him to third place on a rainy Monday night at the Olympic Stadium. Brazil’s Thiago Braz da Silva won the gold with an Olympic record vault of 19 feet, 9 inches. France’s Renaud Lavillenie took the silver at 19 feet 7 inches. “I know that the Olympics is like a high tide. It raises all boats,” Kendricks said. Kendricks said he will be proud to take the bronze medal home to Mississippi from Rio de Janeiro. “I did not set a personal best, but I attempted it, and I missed it very close three times, so I cannot be ashamed of my effort,” said Kendricks, 23, a University of Mississippi graduate from Oxford who has been pole vaulting for 10 years. He considers his competitors friends and knows them all by name. They have traveled together and competed many times, frequently trading victories. The drama peaked as the clock approached midnight, partly because of rain delays, which made for a long night at the pole vault pit. “I learned today that nobody pays attention to the weather in Brazil, because it can change so fast,” Kendricks said. After missing his third attempt at 5.93 meters or 19 feet 5 inches, Kendricks assumed the role of spectator. “It was a beautiful moment to watch something completely unexpected happen,” Kendricks said. He recalled track athletes back home saying winning a medal would change your life; his Olympic experience has taught him that your life is changed along the way to winning a medal. “With all the journeys and sacrifices that you make and all the training that you do, and the people you leave at home to watch, that is really the value of the medal,” he said. His future journey will include time serving as a second lieutenant in the Army Reserve. Besides that, he is keeping his options open. “I would certainly love to compete for the United States Army in any capacity, like the World Military Games, especially,” he said.